The controlled and guided enquiry and real-time assessment of thinking processes afforded by Cooperative Learning do provide the tools for enquiry in RE while driving the “hard” elements of the curriculum. This Thursday, Alan Brine of HMI opened up the discussion of RE vs. P4C at the Realising the Potential conference at East Anglia University. 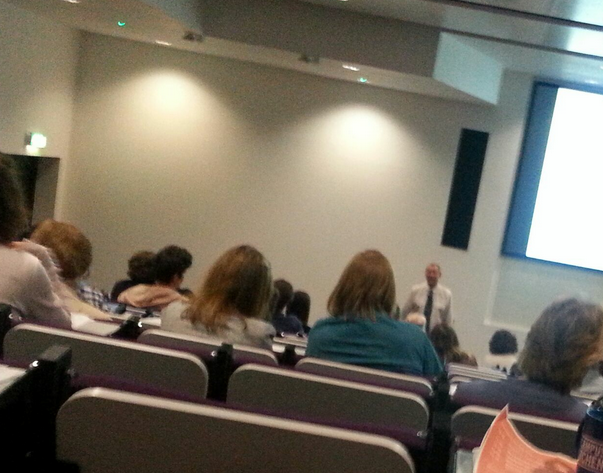 Highly relevant to the preceding posts from Edinburgh University, Thursday saw a very interesting conference at the University of East Anglia on Religious Education related to Ofsted’s report Realising the Potential. The keynote speaker, Alan Brine of HMI, opened up a number of issues directly relevant to the of the wide scope of RE I have discussed in the posts on Matthew Vince and Mohammed Elshimi‘s presentations, as well as my own “The Student-Centred Classroom & The Self-Centred Student.” . Incidentally, I bumped into a local RE teacher who was a participant at the recent Norwich educators’ workshop on Islamic education, and we mused on the fact that the report reflected exactly the content and form of the structured enquiry presented therein. Stick to the facts… but which ones? Much to my surprise, however, Mr Brine presented a case AGAINST working identity and philosophy into RE, pointing out that the primary focus on religious literacy is lost. (A full, and very worthwhile read on his thoughts on this and other pitfalls in RE is found on the re-vamped RE:online – see What Lies Beneath? Reflections on the 2013 Ofsted report). I do hear his argument, but the sheer need negates it – finding valid identity in the stormy sea of meaning in the new global and multicultural environment is relevant for everyone, and cannot be left to peers or internet. In this brave new world, schools must provide the vocabulary, the philosophical insight, the grasp of politics, the logic, the higher level thinking and rhetorical skills to ensure an inclusive, relevant debate; an open mind able to make informed decisions on where to draw it’s boundaries and standing on a stable platform. Kick over the toxic waste barrels… and then what? Also, Alan Brine touched upon the potential problems of enquiry-based learning potentially leading to enquiring into controversial or offensive (may we say PC?) material. Mr Brine actually implied the inherent question whether debates should be limited, which participants will fondly remember from the Healing Fractures workshop. This was actually a theme I had saved for a later post in the BRAIS conference series; in the education panel in Edinburgh, I sat with an elderly gentleman from Cumbria University, who gave some rather detailed reflections on what he called the “sanitized version” of Islam presented in RE – quite courageously, I thought, as half the people in the room were Muslims. I swear you could have heard a pin drop during that talk. The issues he raised are absolutely valid though. Especially as sweeping these things under the carpet provide endless ammunition for extremist groups in the other end of the spectrum because there is never any open discussion, and create the aura of secrecy and manipulation which has made the Birmingham catastrophe possible. I refer to What comes out of the Birmingham “Trojan Horse”? and I again state my claim that the controlled and guided enquiry and real-time assessment of thinking processes afforded by the structural approach to Cooperative Learning do provide the tools for enquiry in RE. Not just in relation to “religious literacy,” hard facts, assessment of sources, etc, but also in for looking at controversial issues from different perspectives, which would allow a smooth integration of HIGH-QUALITY and RELEVANT sciences such as anthropology, history, etc. as well as a very hands on discussion of the definitions and consequence of belief, especially one’s own beliefs, how beliefs are formed, etc. It would also involve a staged discussion on ancillary topics such as limits of debate and belief, coexistence, citizenship, and so forth, which are naturally relevant in that context. Again, the potential mess of the above mix is avoided by the tight classroom control and verbalization of thinking processes made available through Cooperative Learning. In addition I would argue against Mr Brine’s position that given the growing requirement for knowledge transfer, agility and whatnot (lumped as 21c skills) required by today’s business environment, this multi-faceted lesson is something that cannot be avoided. But yes, not crammed, and no superficial questions or navel-gazing. As I pointed out earlier in Facts vs. Free thinking, with Cooperative Learning it’s not a question of either-or. Alan Brine gave a brilliant example of a lesson on pilgrimage where students had been asked where they wanted to go, and the majority had honestly answered “vacation”; but if you read my presentation from Scotland, you will see I am NOT the average “What’s your opinion, Bob” type of enquiry teacher. Ofsted and the Wheel of Life? On a closing note, Mr Brine – standing under a overhead with Ofsted’s stylised fleeing children – closed with a personal vision that left me doubting my hearing: that spirituality should not be limited to RE, but rather be integrated in every subject. Take’s more than a good heart for the HMI to stand up and say that for the record; which government is going to put that into the curriculum? Disclaimer: This material represents my own focus and understanding and do not seek to accurately reflect the intentions of the speaker.